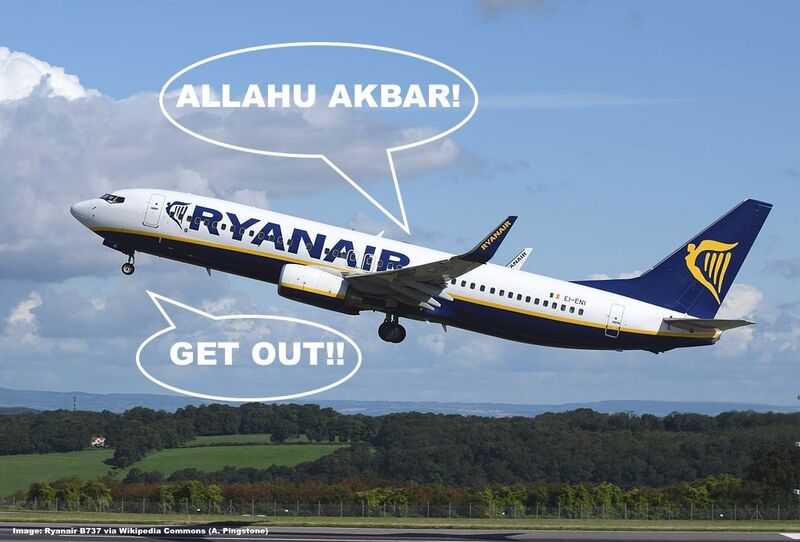 A group of passengers flying Ryanair from Brussels to Madrid thought it was a good idea to make bomb jokes and shouting ‘Allahu Akbar’ through the plane which saw them eventually kicked off the flight. Eventually everybody had to disembark for extra security screening of passengers and baggage which for obvious reasons didn’t make the offenders very popular. The Daily Mail (see here) was one of the newspapers that reported on the incident. Nine men have been thrown off an early-morning Ryanair flight to Madrid after one of them shouted ‘Allahu Akbar’ ‘as a joke’. The flight, which had been due to leave Zaventem airport in Brussels at 7am this morning, was delayed for several hours with all the passengers being ordered to get off after the scare. Police have confirmed the incident to the local news channel VTM Nieuws which says the nine men were all of Belgian nationality. They were getting on board the Ryanair plane to head for Madrid when one of them was heard shouting ‘Allahu Akbar’ and indicating there was a bomb on board. All the luggage had to be taken off as the bomb squad was called in with sniffer dogs. Nothing was found and the plane was eventually allowed to leave at 9.25am. One of the men at least will face prosecution as it is an offence to cause a false bomb scare. A full investigation is underway and a preliminary report has already been sent to the local prosecutor’s office. A Ryanair spokesman said: ‘The crew of this flight from Brussels to Madrid (2 Sep) requested police assistance after a number of passengers became disruptive prior to departure. Police removed and detained the individuals before the aircraft departed to Madrid. Just shouting ‘Allahu Akbar’ (God is great) wouldn’t be an offense but the bomb scare is something not to mess around with. Ideally these people would have to reimburse airlines and other passengers in such a case where their childish and irresponsible behavior causes loss of time and resulting damages. Having a plane searched by a bomb squad is also not exactly cheap. Next articleCaution: Air Berlin Starts To Cancel Many Flights ‘For Operational Reasons’ – The Beginning Of The End?